TAG students watch intently as Tom Overgaag ’17 drops quarters onto a floating piece of aluminum foil. 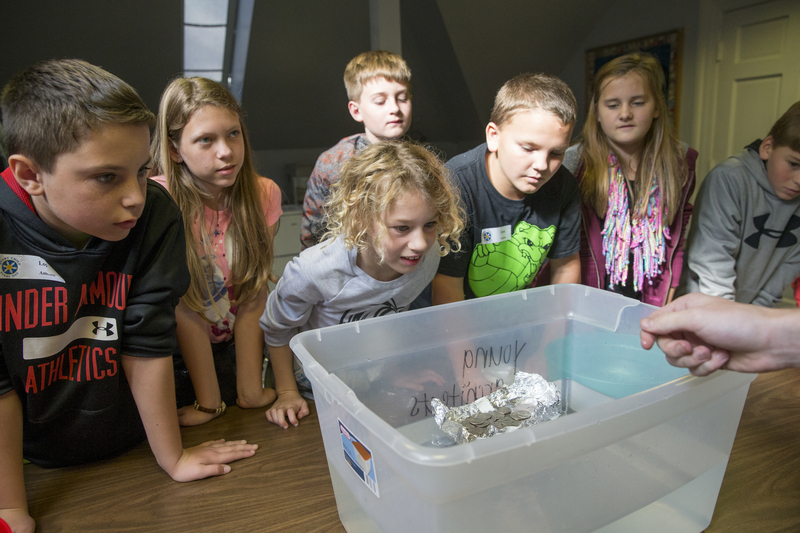 A dozen elementary school students watched with anticipation as Tom Overgaag ’17 dropped more than $15 in quarters onto a newspaper boat floating in a plastic container filled with water. When the 62nd quarter dropped aboard, the paper boat teetered, then slowly sank as students laughed and cheered. The “Let’s Build” workshop was one of several activities Randolph education majors set up for 51 visiting Amherst County Talented and Gifted (TAG) students in grades 3-5 on Wednesday. For this hands-on learning experience, TAG students were split into groups and crafted handheld “boats” using household materials like paper, plastic wrap, and aluminum foil. Overgaag then tested their durability by piling quarters on them, while Jessica Nowak ’16 kept a tally of how many each boat held before sinking. 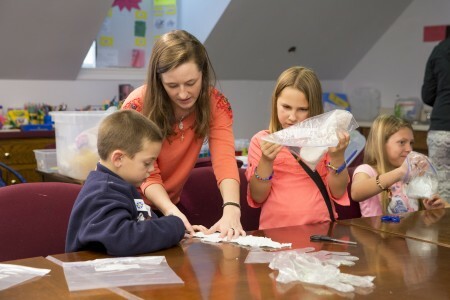 Grace Cummins ’16 teaches TAG students about polymers. In the next room on the top floor of Thoresen Hall, TAG students learned about polymers and their absorbent properties. Grace Cummins ’16 told TAG students that skin, paper, plastic, wood, and cotton all contained polymers. For this particular exercise, students sealed a diaper and colored water in Ziploc bags and shook them to see how much water the polymers in the diaper absorbed. While at Randolph the TAG students also ate with College students in Cheatham Dining Hall and toured the campus. 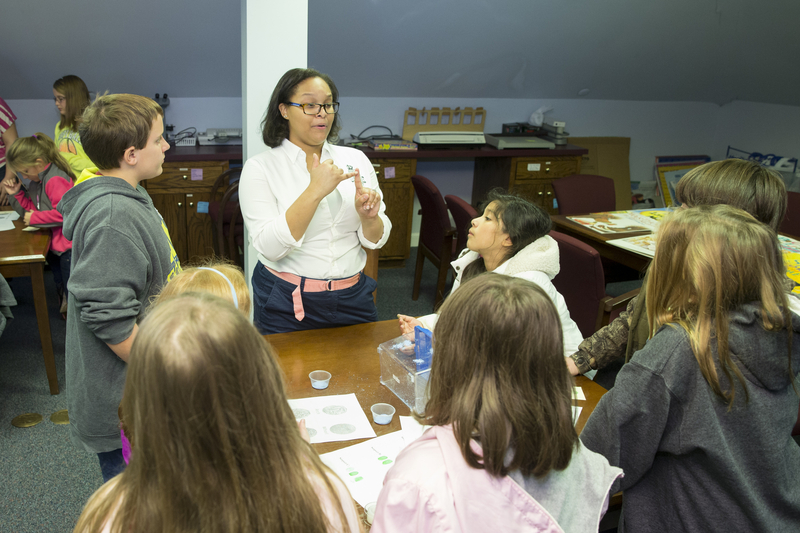 Tia Jones ’17 said she was impressed by the TAG students’ intelligence and enjoyed making science fun for them. Tia Jones ’17 explains the various kinds of finger prints.